The AmD with AutoAid/RCIB Insurance Racing team maintained its recent strong form with another three top finishes in the latest rounds of the Dunlop MSA British Touring Car Championship season at Knockhill. 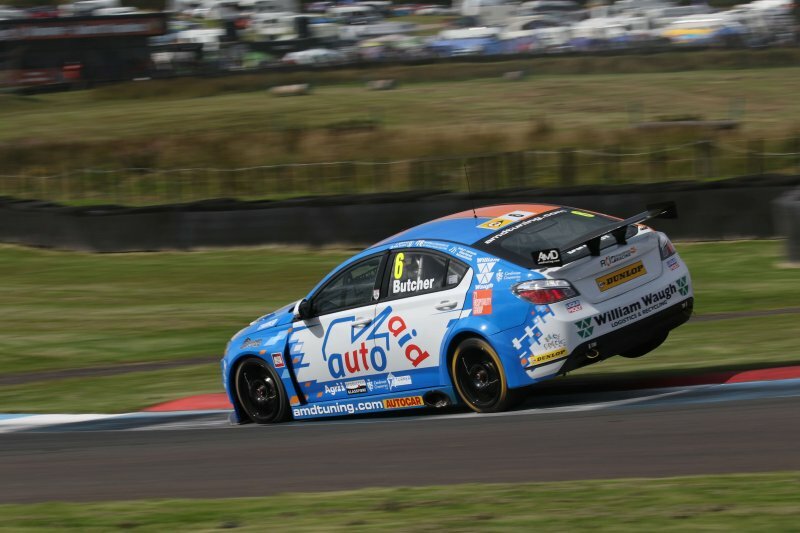 The West Thurrock-based team made the long trip to Scotland on the back of a solid weekend at Rockingham, where Fife racer Rory Butcher was able to match his career best result of sixth and Aberdeen-based team-mate enjoyed a solid debut in the second MG6 GT. Buoyed by his performance in Corby two weeks earlier, Rory headed into the weekend at his home circuit eager to impress but endured a tough qualifying session on Saturday that left him 23rd on the grid for the opening race of the weekend. The arrival of rain on race day would work in his favour however, and an impressive drive in the opening race saw him storm through the pack to bring home a top ten finish. Rory followed that up with ninth place in race two, which would then become seventh when the leading two cars were excluded from the results, which left him well placed for the third and final race of the weekend. Lapping as quickly as anyone else on track, Rory battled up to fifth spot and looked set to secure his best result in the series to date until an error at the hairpin in the closing stages dropped him back to seventh. Rory now sits eighth in the Independents’ Trophy standings and third in the Jack Sears Trophy. Team-mate Glynn qualified in 27th spot at the wheel of the second car but also made forward progress in the opening race of the weekend as he made his through to 20th spot in the tricky on-track conditions. The former British GT champion would follow that up with 17th place in race two before the two exclusions ahead saw him promoted into 15th – allowing him to break into the points for the first time since returning to the series. Like Rory, Glynn went into the final race of the weekend keen to continue his progress through the field but when the inside of his car started to steam up, he found himself struggling for visibility and slipped back to 18th having run strongly inside the points in the early stages. “Saturday was a tough day as we don’t seem to be able to that that one quick lap out of the car in qualifying like some of the others do. But we knew we had a strong race car and with the rain that was forecast, I was confident that we had a good chance of some decent results. “The car was as good as ever and was very stable in the conditions which allowed me to push forwards into the top ten in race one and that was key. From there, we showed we had the pace to run with the top five and it’s a shame that a small error on my part towards the end meant we had to settle for seventh in race three. “It’s been a bit of an up and down weekend. I’ve not quite had the overall pace throughout the weekend and if I’m being honest, I think I should have done a bit better. The first race was down to me mostly and race two was okay and it was good to end up with a point at the end of it. “As at Rockingham, it’s been a good weekend for the two MGs and we leave Knockhill pleased with some strong results on track. We came into the weekend feeling optimistic about what we could achieve and it was great to see perform well on their home circuit. “Rory did a great job throughout race day after a difficult Saturday and to see him running so strongly in the top ten was fantastic. He drove superbly and to have now finished inside the top ten in six straight races shows we have a strong race car. Thanks as always to Marc Waller for the photography!